Like other Asiatic black bears, the Japanese black bear (Ursus thibetanus japonicus) usually has a pale yellow crescent marking on its chest. In Japan, it is also known as tsukinowaguma which means moon circle bear. Eastern Honshu is the only place in Japan where the black bears have any kind of a stronghold. The bears' home range is supposedly between 10 and 15 square miles, though this can vary depending on food supply and human encroachment. The more fragmented and degraded the bears' habitat becomes, the more distance they may be forced to travel to survive. The bears in the mountainous areas hibernate where there is snow on the ground for most of the winter. The snow helps to keep them warm by serving as an insulating blanket over their dens. 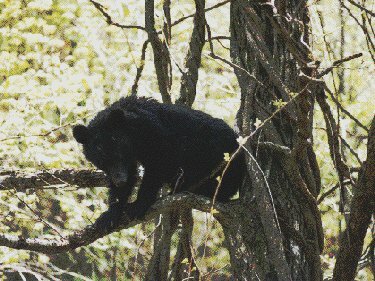 Black bears are excellent climbers. They build nests in trees and on steep slopes, called enza in Japanese, that they use for either eating, resting or sleeping in. They also den in hollow trees, under large rocks, or in the ground. 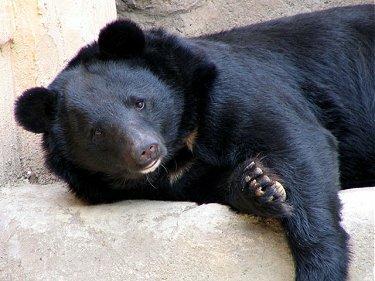 Other than the fact that they are a bit smaller, Japanese black bears appear very much like the average Asian black bear. On average, they measure between 43 and 60 inches in length and weigh between 130 and 260 pounds. Females measure approximately 75 percent the size of males. Most Japanese black bears are nocturnal. However, this has partially to do with location and the fact that the bears tend to avoid humans. The Japanese black bears feed mainly on plant material year round. Depending on the time of year, their diet consists of acorns, beechnuts, oak nuts, green shoots, cherries, ants and other insects. Acorns are the most essential food to the bears in the fall, providing them with sufficient body fat before going into hibernation. The Japanese black bear is an omnivorous creature. It will eat small animals such as frogs, lizards, crabs and carrion. However, it seldom hunts animals and feeds mainly on vegetation. Something else that black bears in Japan do is gnaw off bark to get to the sapwood of valuable timber trees. Unfortunately, this damages and can even kill the trees, having a negative impact on the timber industry. Numerous bears are killed every year in attempt to reduce the problem. Females mature between 3 and 4 years of age. Breeding season is anywhere from late May to early August. The gestation period is 6 to 7 months. However, implantation of the fertilized eggs is delayed 4 to 5 months in order to give the mother time enough to build a reserve of fat for the cubs and her to live off of during hibernation. Birth occurs in the den during the hibernation period in mid to late February. There are usually 2 cubs (one male and one female) per offspring, weighing between 7 and 14 ounces. The cubs reach about 20 pounds by April or May when they leave the den. They hibernate with their mother again the next winter and then separate the following summer. 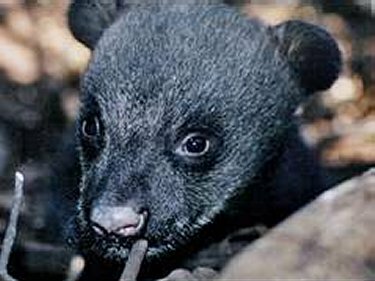 The Japanese black bear became extinct on the mountainous island of Kyushu back in the 1950s and is considered extinct on the island of Shikoku. Only on Eastern Honshu are the black bears considered to be healthy. However, even the bears on the main island of Honshu still have to deal with continuous human disturbance. Much of the bears' original habitat has been lost due to the establishment of mono-cultural timber plantations that started in the 1940s during World War II when Japan needed the resources. Such uncontrolled harvesting and deforestation has continued to expand, forcing the bears into villages and farm areas where they are considered by the people to be a nuisance. Japanese black bears continue to be killed for the sake of the economy. In order to control "bear nuisances", hunters work on a voluntary basis because they are allowed to keep what they kill and sell the bears' body parts. There are thought to be fewer than 10,000 black bears in Japan.